Wrights, Luci D. Dreams, and Beau T. Call (top left). 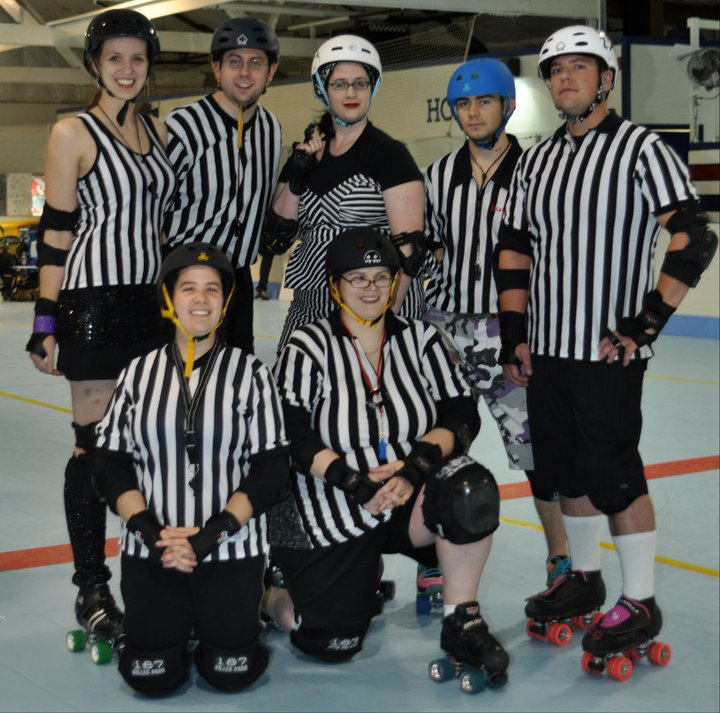 Last Saturday, I had the privilege to officiate at the Jerzey Derby Brigade Roast-Her bout, featuring the JDB Corporal Punishers vs. the WB Scranton Roller Radicals. Both teams were very competitive, and at the end of the bout, it turned out that the scores were tied! This is a relatively rare occurrence at derby bouts, but when it happens, a special set of rules kick in and let the fun continue in an Overtime Jam. Overtime Jams usually begin with an Official Time Out to double-check the scores. The score trackers will make sure that the score on the scoreboard is current. The referees are also using this time to remember the four special rules that kick in during an Overtime Jam. The four special rules are fairly easy to remember. First of all, there will be one minute from when the Official Time Out ends until the Overtime Jam begins. This extra time is for the teams to sort out any special plays they might want to use. WFTDA Store and don't leave home without it. The second rule is that there is no Initial Pass. The Jammers start scoring on their first pass through the pack. This rule keeps the action going, and gives a 'sudden death' feel to the Overtime Jam. The third rule is that there is No Lead Jammer. Since there's no Initial Pass, there isn't a Lead Jammer. Pretty logical, I'd say. The final rule is that the jam will last the full two minutes. Since there's no Lead Jammer, nobody can call off the jam, so it will last two minutes (unless there's an injury, or the lights all go out, or that sort of thing). Otherwise, the Overtime Jam is just like a jam in regulation time. Penalties will be called just like they were during the last hour of play, so it pays to skate clean in an Overtime Jam. Your minor penalties will also carry over from regulation time, so it might behoove a bench coach to put skaters with fewer minors in the Overtime Jam. One observation about an Overtime Jam is that the crowd has lots of energy and gets very loud and expressive. This energy is very contagious and distracting at the same time. It's something to think about if you are a communicative skater (or if you're a ref trying to send a skater to the box). When the Overtime Jam is over, the score will be tallied again, and the winner will be determined. If the score remains tied, there will be another Overtime Jam (with another one minute before it). This could conceivably continue until Armageddon, but even a second Overtime Jam is very rare indeed. One final twist is that if the Overtime Jam is called off early due to injury or other unnatural endings, the running score will stand (unless it is still tied, in which case there will be another Overtime Jam). Again, this rarely happens, but it's what the rules say (Section 2.5, Overtime). Overtime Jams and close bouts are very exciting. They are slightly different from regulation jams, but the differences are fairly easy to understand and remember. If you ever experience an Overtime Jam, you will understand how they exemplify the energy and sportswomanship which is the spirit of Roller Derby. One of the most common comments I get when people ask me about roller derby is "you mean like fighting on roller skates?" and then they pretend to elbow me or someone else in the vicinity. No, I say... you can't elbow anyone under our ruleset. Or punch, trip, kick... or any kind of fighting. "That doesn't sound like any fun," they say. 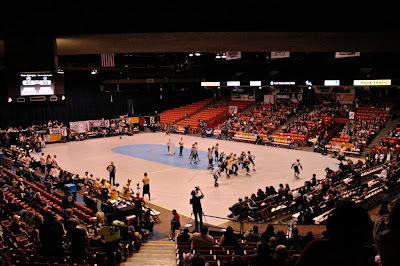 "I used to watch roller derby on TV when I was a kid. It was on after wrestling!" Sigh. Of course then I get into it about what IS fun and awesome about it. Leaving both sides mostly satisfied. I've never seen that version of roller derby that was "on after wrestling", but I've wondered about it. And now I have my chance to witness it, first hand. 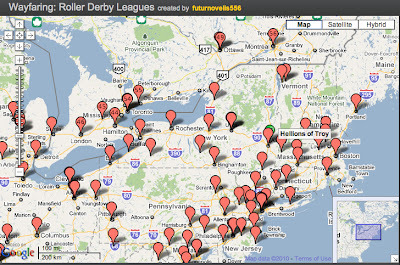 This weekend is the 2010 Old School Derby Association (OSDA) Championships. 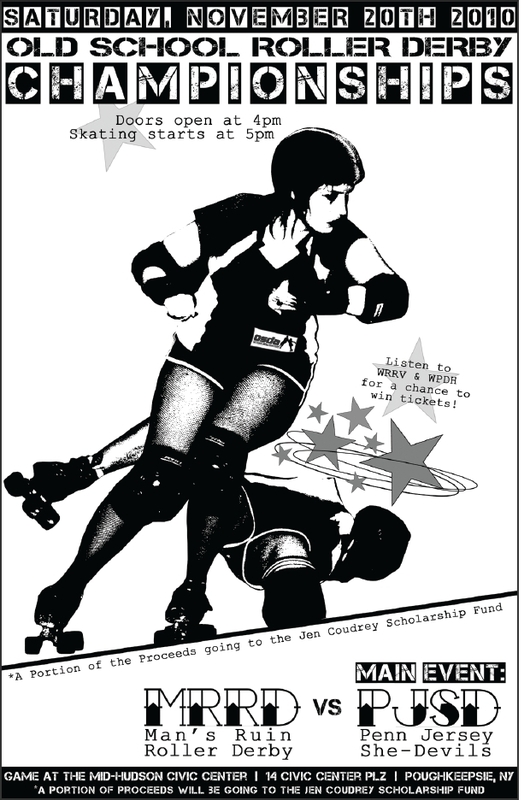 The event will be held in Poughkeepsie by the 2009 Defending Champions, Man's Ruin, who will take on the Penn Jersey She Devils. What is Old School Derby? 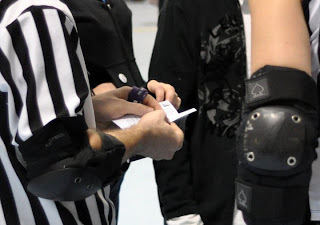 "The OSDA was crated for those who want to skate something more akin to what the original Roller Derby was like. It is the foal of OSDA & its members to restore ties with "Old School" skaters, trainers, and coaches from past decades and leadn from their experiences and input.... Old School rules were created by melding many of the current developments in Flat Track Derby with the rules used by Old School Banked Track Roller Derby skaters." I'm very intrigued and hope to get down to Poughkeepsie on Saturday to check it out! I'm not interested in playing OSD, but I think this would be a neat opportunity to get a better understanding of what it is. I'm sure it will make my head explode, haha. Check out this webpage that I recently came across. Someone (wayfaring user futurnovelis556) put together a map of all (?) 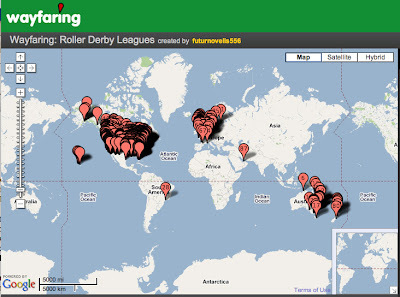 the roller derby leagues in the world. I say "?" because I am not sure when this was created or last updated, but it includes the Hellions of Troy! 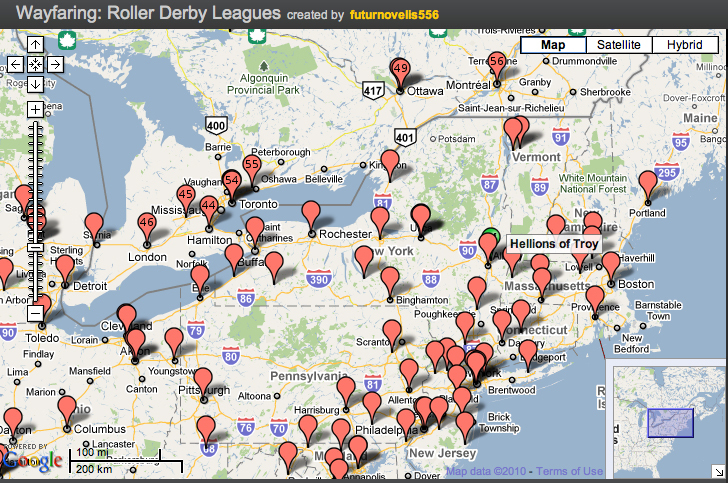 And check out how many leagues there are in New York and the Northeast! I guess you can say, we're on the map! Below are photos from Day 1 (Friday, November 4) of the 2010 WFTDA Championships hosted in Chicago, IL. All photos by either Nicole Flaherty (Doc Bi O'Hazard) or Marcie Pry (Short Temper). Photos from Day 2 and Day 3 to come. Demanda Riot of B.ay A.rea D.erby (B.A.D.) 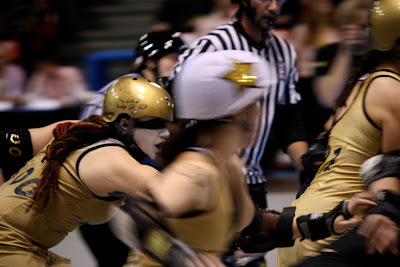 races up to assist her jammer in the first bout of the day - B.A.D. vs the Texas Roller Girls. Photo by Nicole Flaherty. Demanda Riot and Burly Bot of B.A.D. Photo by Nicole Flaherty. View from the top of the seating area. There was not a bad seat in the house. B.A.D. vs the Texas Roller Girls. Photo by Marcie Pry. Remember how I traveled to NYC the other week to see Bombshell and her team mates in the Gotham Girls Interleague Championship bout? That bout will air this Friday night at 12:30am, November 12th, on NYC life (Channel 25/22). I don't get that channel, but if you're in NYC check it out! Maybe it will also be online at some point? I will keep you updated. Anyway, The Beirut Bombshell, one of the founders of the Hellions of Troy and now skating with Gotham, was recently featured on their website, which also links to our website. Thank you for the HoT love, Bombshell! 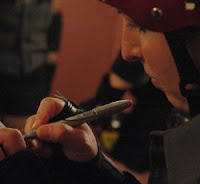 What brought you to join the Hellions and to roller derby in the first place? My path to roller derby started with a moment of clarity. I attended my first ever bout and at about half time I couldn't stand it anymore; I needed to play. It felt like I had found something I was missing. 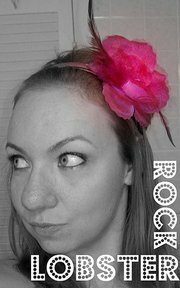 I was at a place in my life where I needed something to prod me on and roller derby became that something. What's inspires you, and or what in your life has prepared you to keep coming back and to excel in this sport? I think the primary skill all new girls have in common is that ability to show up to practice and at least try to do what they say even when it looks like a really bad idea. Beyond this universal starting point what drives each of us is unique, for me it is my extreme competitiveness. Winning is important to me, each new skill I master is a win, each practice I attend when I would rather nap is a win, each time I fail and try again is a win. Roller derby has provided all of those gold stars of accomplishment I miss from school. How has playing this sport and being part of the Hellions community affected you and your family? The Hellions community is my first ever exposure to a team atmosphere. I was surprised by how together they are, truly they have formed a strong sense of unity while still being competitors. These are girls who will try very hard to knock me down and then give equal effort to help me back up. I skate harder to earn my place. 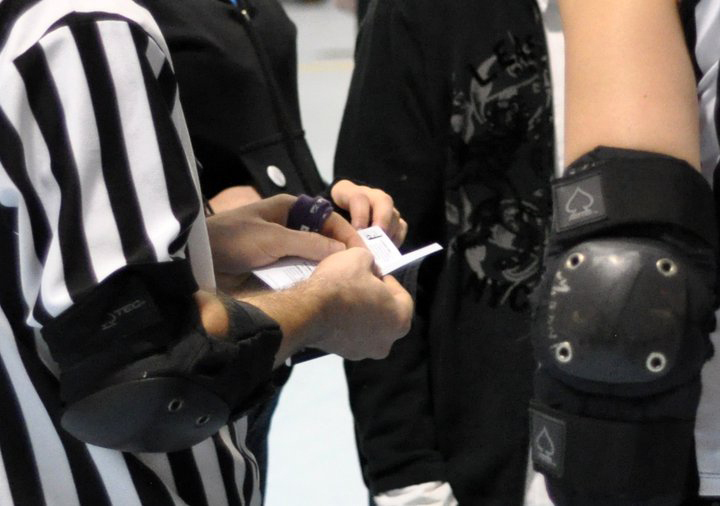 What are you finding to be the most challenging part of roller derby? The biggest challenge I face is myself, which is probably true of most girls. I am very hard on myself, when you challenge a classic over achiever either she excels or she implodes. I am never truly satisfied with my skills, praise rolls off my back and I focus on what should have been better. My challenge is treating each practice as a clean slate, each lap as a new opportunity. The most rewarding part of derby? Anything else you'd like our readers and fans to know about you? Roller derby slowly creeps into your identity, being able to skate low makes you stand taller; exercise is more fun when it consists of left turns and all you need to join is the ability to show up. 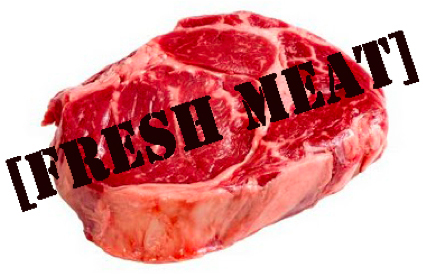 Catch up on previous Meat Locker Missives here. Last weekend, Shrimp Scampi and I headed to NYC for the Gotham Girls Intraleague Championship bout featuring the Bronx Gridlock vs the Queens of Pain. Bronx Gridlock features notable skaters such as Bonnie Thunders and Ginger Snap. Queens hosts my fave Gotham Girl, The Beirut Bombshell, as well as Hyper Lynx and Suzy Hotrod. Scamp and I got down to the City on the earlier side, and spent the afternoon in Union Square and made a pit stop in Times Square as well. 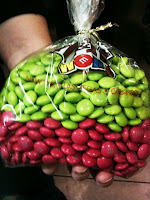 Scamp got like 3lbs of Hellions colored M&Ms from the M&Ms World store! 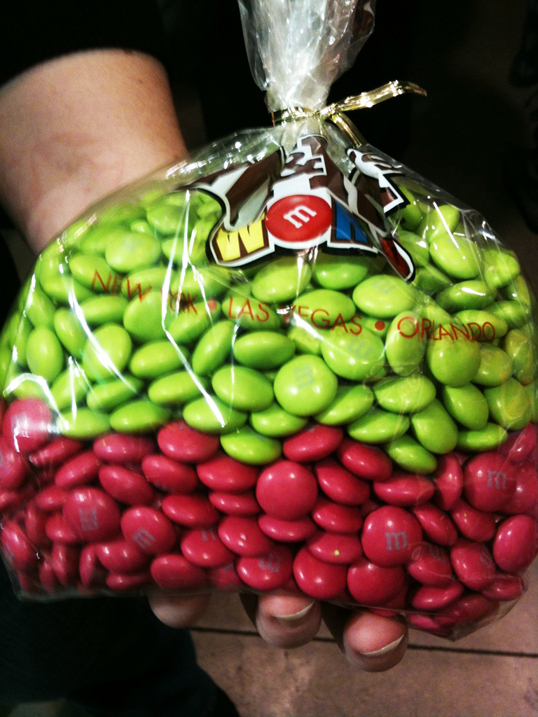 My favorite candy! Anyway - the bout. The Bronx took the lead off the bat but Queens was close behind. 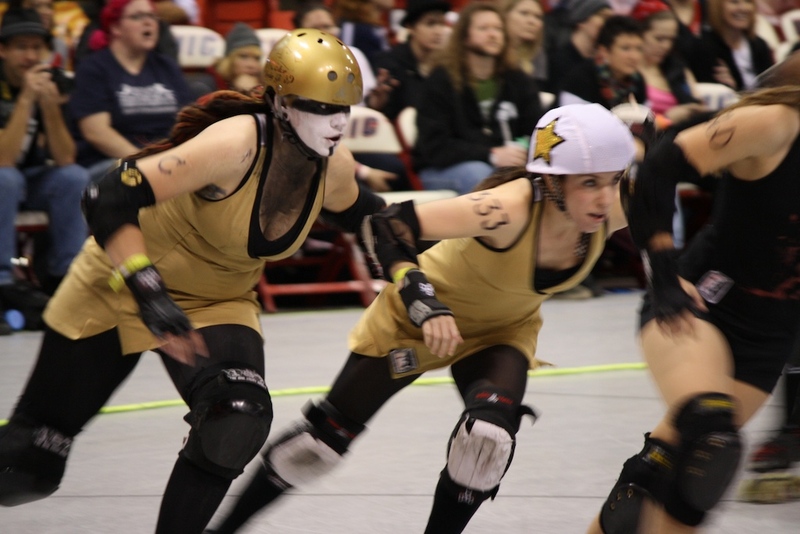 I have never seen a Gotham intraleague bout before, so it was really interesting to see Bonnie Thunders faceoff against Suzy Hotrod (and also apparently the last time anyone will see it... maybe...especially as speculated by someone in the costume contest). This bout also featured Hyper Lynx as a jammer frequently, which was neat because Gotham's top jammers in interleague play include Bonnie and Suzy, with Hyper Lynx being more of a backup jammer. I love watching her play, though. It was also interesting to see Bonnie and Suzy faceoff against each other. I've never seen more jammer on jammer action - they both really go after each other if they are neck and neck as they race around the track. Lucky for me, Eloda Sarcasm and Ida Feltersnatch have already landed in Chicago and have spent most of the day there. They've checked into the hotel, have ridden the L, and have thoughts on the weather. Here are some notes I got from Eloda today. If you do not have a lot of luggage, arriving from the airport, I suggest the train. The 3 day pass is $14. The ride in was nice, and commuter heavy the closer you got into the city. Best part beside the price? Traveling along at a decent speed while cars are at a standstill on the highway. From O'Hare Airport take the Blue Line to the Monroe Street stop (subway station). Follow the flow of traffic traffic 1.5 blocks down Monroe Street to the Hotel, which is between State and Wabash. From Midway Airport take the Orange Line to Adams and Wabash - it's 1/2 block from the Hotel. 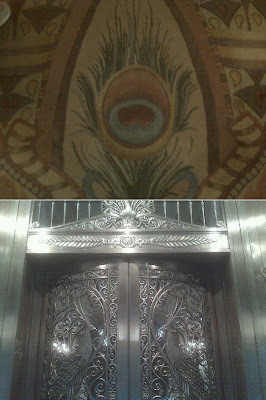 Peacock imagery throughout the hotel. The is no free wifi at the hotel. It is $15/day. There is a business center and a super close Starbucks with free wifi. There is no little coffee pot in the room (which I have come to take for granted), but there is a Starbucks in the street level lobby, and one just down the street. This hotel has probably never seen anything like derby in its halls, and I cannot wait to watch staff take it all in. If you have an irrational fear of peacocks, cancel your reservation and stay somewhere else! For realz. You cannot check in until, the earliest, 11am, and that is NOT a sure thing. It's all based on room turnover. You can leave your bags upon arrival to get out and explore, then they bring them to your room upon check in. The architecture here is gonna blow your mind. The ornamental iron and rooftops are amazing. It's chilly here so be prepared. There isn’t a bad seat in the house! You will not be able to sit on the floor, at least not your behind. All fans with VIP seats, will have floor access and a metal chair near the track. Personally, I prefer the stands to the track-side chairs. You’re closer to the beer, bathrooms and like I said…there is not a bad seat in the house. Bring your wallets, beers are $9, but there was a decent selection of quality beers.